The SC821 Plus provides breakout box capabilities and LED indicators which practically eliminates the time and frustration of debugging an RS-232 interface. All you need to do is set three switches that control the data lines, control lines and correct handshaking protocol. 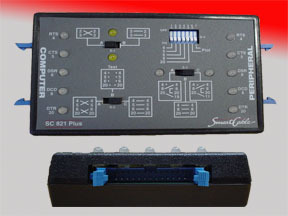 The SC821 Plus comes with dual gender DB25 connectors on each end. It will also work on DB-9 connectors. For special non-standard applications, there's an additional 7-position dip switch which allows you to provide pull-up voltages to the major control or handshake lines. The SC821 Plus is both an intelligent cable and diagnostic instrument in one package that instantly interfaces two RS-232 asychronous serial devices while simultaneously providing a graphic display of the interface configuration.